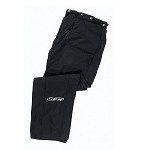 The PG Pant is built with a high quality Sonatex polyester material for breathability, with doubled up ribbed lycra up the insides of the legs for added strength, comfort and flexibility. I switched to PG's after the constant quality issues with the CCM's. After 1 season, I'm impressed with the quality. A couple things to know about the PG's; If you use suspenders, the rear suspender bolts are too far apart to use normal hockey suspenders with a single back strap with the 2 hooks 6" apart on a single lead. You'll need to get HD suspenders with double straps below the back strap junction. I found mine at Mills Fleet Farm, they also carry them at Duluth Trading Co. The fly is hook & loop (velcro), which works fine, just takes a bit of getting used to. The reason I gave them 4 stars instead of 5 is the suspender issue. I had to spend an extra $20.00 for suspenders when my hockey suspenders, that worked fine on every other pair of officials pants I've owned, had to be replaced when they still worked fine. I have worn many different referee pants incl. CCM PG100, Stevens Shell, CCM PP8L, and the Bauer (not sure which). 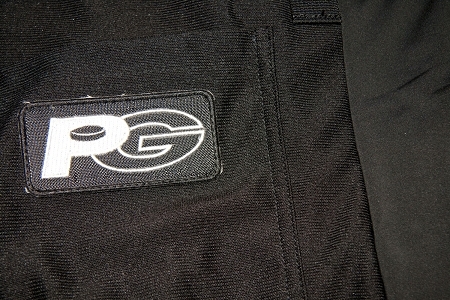 The PG Pro Referee Pants are by far my favorite. The durability is top notch, they have a great feel to the material, are cut very nicely, and drape well, all-In-all the look and wear very professionally. Obviously you can tell i'm one to try many things to find what I like, however, I will not be changing my pants anytime soon. NOTE: These, like all referee pants, must be hemmed. Please choose pants based only the waist size.